Standing Stones – Information required – can you help? We started off the New Year as we all hope to carry on, with an exercise class! Linda Banting from Move it or Lose it had us all moving on our chairs, then standing up to loosen up and finally throwing balls at each other. What great fun it was. The lifts were organised for our New Year lunch at the Imperial Hotel, with a reminder to give £3 to the driver. The President read out the 2019 Resolutions. More information on these will be found in WI Life. Our first vote was in favour of the one about Smear tests. F.o.m was won by Jan, the Competition for a Healthy Cookbook by Paddy, Jan and Pat S.
The Air Ambulance mast (that we held the cream tea to help fund raise for) is now being put up in the field. Members wrote their names on the 70 birthday tablecloth, and so now it is ready for us to take it home to embroider them. The Craft Group will be knitting fingerless gloves next time. Skittles will start again on 16th January, and continue on Wednesdays at 11 am. Vouchers were given out for the free session at Art Mash in Braunton for those who were entitled in the craft group. Lisa the owner has said to go along when you want. The Lundy Group committee is now formed and will be asking for various volunteers nearer the time. Next month we will be entertained by cake decorating and entertaining ourselves by decorating cupcakes. 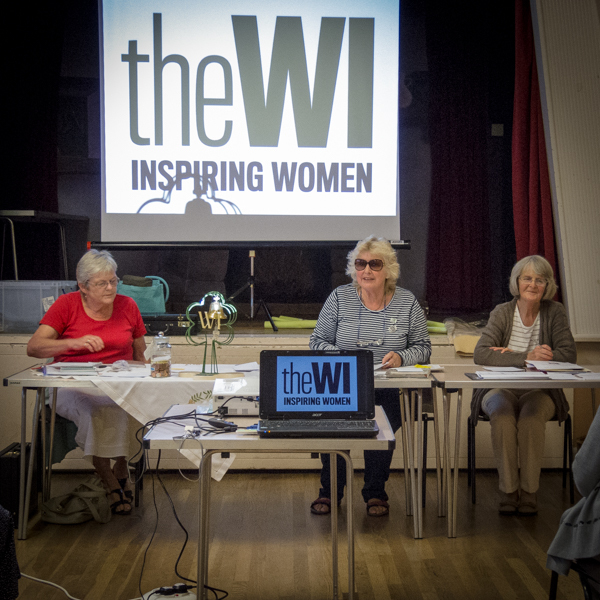 You will be pleased to know that the West Down WI raised £600 at their Cream Tea on Sunday 29th July 2018 to help raise funds for the Air Ambulance Landing Lights that will be located in the Community Field. Many thanks to all our members who donated goodies and their valuable time (no expenses claimed). Many thanks to Tony of the Pantry Bakery in Ilfracombe who donated 100 scones. This event was a resounding success and as such a very special thank you to everyone who came along to support the occasion and to those who gave extra donations. Here are the reports on our June and July 2018 meetings – two for the price of one! Last month we had an artistic session with members drawing, in charcoal and pencil, a live model in two different poses. Our teacher was Beryl Keeble a local artist who guided members through the shape and poses of the member who sat and then stood for 20 minutes each time. Earlier in the month some of the ladies had another practice session at skittles with Coombe Martin W.I. at The Pack of Cards. To celebrate the 100th anniversary of the vote for women, every month from now on, one of the members will be telling us about a lady who has made some difference to the world by doing something outstanding. Cakes and help were requested for the July Village Fayre and also for our fund raising cream tea for the village helicopter landing lights. The Craft group in June were shown by Caroline Baxter how to do wet felting. Everyone produced a picture to be framed or used as part of something else. It was good fun and provided exercise while rolling the wool! At the beginning of July a lot of the members went to Violet’s coffee and cakes morning, with a quiz, bring and buy and raffle, and it was a triumph! We had a tour of her lovely garden near Marwood and saw runner beans ready to pick already. Some members even felt inclined to do a bit of therapeutic weeding! The speaker this month was one of our members Mary Gingell, who told us about her trip to India. This was somewhere she had remembered her father talking about and had been interested in ever since. This was a fabric and craft based holiday. She showed us photos of silk dying with natural colours, fabric painting, weaving with gold thread, pottery making. She also told us of other interesting things the group did, like a tuk tuk ride to a market, bracelets made of stephanotis, trying on saris and watching the making of Costa coffee bags. One of the hotels they stayed at was near a 600km long beach. The competition of an Indian animal was won by Jan and her colouring in picture of an elephant done at Barnstaple library colouring session. F.O.M was Ruth’s clematis. Members have been asked to think of a theme for the Spring Lundy Group which we are hosting. The Autumn one will be on 6th October organised by Coombe Crumpets in the hall opposite Pip and Jim’s. The 26th July is our next craft session, this time at 10.30 in the Iron Room. Bring odd bits of soft fabric, scissors, needle and thread. There is no usual W.I. meeting in August but we are going on an outing to Filleigh on the 9th. Our next meeting is on 13th September at 2 pm in West Down Hall as usual. This is a bring a friend evening, and we have a popular speaker, Liz Shakespeare, talking on Fevers and Fried Mice! The meeting was opened by Jane Devlin who deputised as President. We all sang Jerusalem and the various announcements on forthcoming events given. Jane explained the reasons why the main resolution at the National Annual Meeting was not voted on. This was an important subject on the distinction between Nursing Care and Personal Care. She had heard all the various views discussed on the subject and it was regrettable that no decisions could be put forward that would help those needing these services. Members were asked to sit for a photograph of themselves to be taken for the Centenary Record which is being produced for this special year. These were taken by Robin Mellor and members details recorded by Anne Mellor who is one of our members. The speaker was then introduced, this was Irene Hahn on her time working for the BBC. She has spent many years first as a Secretary and then in various aspects of producing and presenting Television broadcasts. We found her experiences in presenting Outside Broadcasts to be most interesting. Royal occasions and the timing of events having to be most exact. The ability of presenters to move unexpectedly from scene to interview to balcony appearance in a smooth manner is one of the most important jobs of a good commentator. We all found this a very interesting talk and was much enjoyed. The Competition winner for an old programme resulted – 1. Pat Seymour; 2. Marion Westridge; 3.Roz Quick. F.O.M winner was Jane Devlin. The August meeting will be our Centenary Tea Party. This will be on Thursday, August 13 at the Parish Hall from 2.30p.m. We are invited to dress for the occasion as it will be a very special event. The August meeting was very special and took the form of a Celebration Tea to mark the Centenary of the Women’s Institute movement. In addition to our members we welcomed the County Chairman, Julie Ayre, also some past members who are no longer able to attend our monthly meetings. We commenced with a welcome drink and then sat down. President. Catherine Williams introduced Carole King to read a poem she had composed for the occasion entitled “West Down W.I. Centenary Tea” this was followed by 2 verses of Jerusalem and the significance of the occasion explained. Tea was then served at tables laden with savouries and sandwiches together with a tempting array of fancy cakes, éclairs, meringues and more. Suitably attired waiters brought us Tea in beautiful china pots. We then enjoyed a Piano Recital “Music from the Musicals” given by Rika Shortland. Next,the DFWI Chairman spoke to us about the Centenary and other events. This was followed by the raffle and the National Anthem. At the close members walked to the Community Field for the Dedication of the Centenary Tree planted in Memory of the late Janet Tolman who had been a much loved member. Mike Tolman her husband also attended the tea and dedication. The afternoon brought back memories and photographs were on display of various events we have enjoyed over the years. Catherine Williams, the President opened the meeting with the singing of Jerusalem. The subject was the celebrating 100 years since the formation of the movement. We were shown photos of the ladies who originally formed a group at Stoney Creek in Ontario by Adelaide Hoodless in 1897. The first British W.I. was formed in Llanfair PG in Anglesey, Wales. Amongst the aims of the W.I. are to provide women with educational opportunities, enabling them to take part in many activities and to campaign on issues that matter to them and the community. We learned that during the second World War they ran Government sponsored Preservation Centres where volunteers made Jam and canned fruit from excess produce in season. This was sent to depts. to be added to the populations Rations. Members have recently enjoyed their Outing, This was to Widecombe Fair and benefited from lovely weather. The members competition for an item of Memorabilia resulted: 1, Ruth Verney; 2. Jan Jones; 3.Beatrice Brooks. Flower of the Month was won by Di Pine. 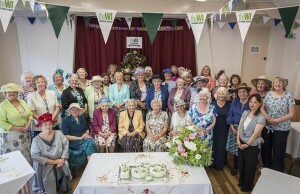 Letters of thanks were read from some members and visitors who had attended our 100 year Celebration Tea Party. We were able to view the photos taken on that occasion. Jane Devlin presided and we commenced with Jerusalem. Members will be attending the Autumn Council meeting and various trips were announced. The Carol service at Bideford is the same date and time as our December meeting. A decision must be made regarding altering our meeting. This has meant many journeys to India where her late husband, a Dentist was the instigator of setting up Dental Clinics in the very poor regions. First we saw slides of the contrasts that still exist in India, The grand buildings in the cities with high populations and the contrasting areas where there are no proper houses and no facilities what so ever. The charity that they supported were setting up medical centres but had no dentist. They found second – hand Dentist Chairs and equipment and shipped it out to India. She then showed us the clinic in action with people willing to wait for long periods to be seen. They did not understand or want an appointment system. Rosemary hopes to return again to India and see the progress in helping these deprived people. She showed some examples of the very fine lace and embroidery made by some of the women, we marvelled at how clean they kept their work which was done in the most primitive of conditions. We all found this of great interest and gave us some understanding of the life in these deprived areas and how they are grateful for any help they receive. The competition was for an Elephant. This Resulted 1. Ruby Ayre; 2. Pat Seymour; 3. Jane Devlin. The Flower of the Month winner was Jane Devlin. We were welcomed by the President, Catherine Williams and then sang two verses of Jerusalem. The speaker was Fran Beaumont who got us all around the table to make a wire and bead star decoration for a Christmas Tree. Packets of assorted beads and a piece of wire were handed out to us together with a sheet of instructions. We then, with varying degrees of confidence, started to thread beads on wire with help from Fran at every stage we soon turned our efforts into a recognisable star. The members competition was for an old Christmas decoration. The winners were- 1. Violet Graham, 2.Ruth Verney, 3. Mary Gingell. The Flower of the Month was won by Margaret Thomas. We will be running a Cake stall at the Winter Fayre on Saturday, November 28 from 10a.m.to 4p.m. and have offered to help sell tickets for the Community Shop Draw from our stall. As the normal date for our December meeting has fallen on the W. I. Carol service at Bideford we have changed our meeting to the following afternoon. Please note our December meeting will be on Friday afternoon, December 11. It will be a Christmas Party with lovely food and we are invited to wear party dress. The President, Catherine Williams opened the meeting and we sang Jerusalem. This was our Christmas party meeting. We enjoyed a variety of games and competitions and sang a selection of Carols. Refreshment were a sumptuous spread of Puddings which we thoroughly enjoyed. Members had attended the Carol service at Bideford the previous day. Our Christmas meal will be at Kentisbury on January 9. A large number plan to attend. The new programme is already available on the web-site. We were reminded that subscriptions are due and are £37.50. The Flower of the Month was won by Jan Jones. During the afternoon we were surprised to be visited by members of the Parish Hall Committee. The occasion was to make a presentation to one of our members, Margaret Thomas. She has recently retired from the Hall Committee after many years on the Committee also as Secretary for a number of years. The Chairman, Terry King made the presentation of a Dartington Glass vase. Also present were John Stainer, vice chairman and Eric Nott a past chairman together with David Ayre, treasurer. THE PRESIDENT Catherine Williams opened the meeting . To celebrate a new year we sang two verses of Jerusalem. The Resolutions for discussion at the National Annual Meeting were read and later a vote on our choice for going forward took place. A team has been arranged for the County Quiz. We welcomed Kevin Patterson and colleague Rob from the local Fire Service, They gave a very interesting and useful talk on their work . We were given advice on how to prevent a fire in our home. Free advice is available to check our properties and we were urged to ask for a Home Fire Safety Check from them. Fire alarms should be situated in the best locations and batteries checked. Appliances should be switched off and unplugged where possible and charging telephones by night was not advised, however to take a mobile phone to bed is a wise move. The competition for a Limerick on Firemen was won by 1, Marion Westridge, 2- Carole King and 3. Sandra Selby. The Flower of the Month was won by Ruth Verney. The Meeting was opened by Catherine Williams, the president and the singing of Jerusalem. The speaker Josie Sims from Appledore was welcomed. She gave us a history of the Fisherman’s Guernsey, otherwise known as a Gansey or Frock. This is a navy blue sweater made of worsted wool which makes it almost waterproof. They are widely worn by fishermen throughout the U.K, slight variations helps to identify the areas from which they come. She brought with her an example which has been worn for 50 years. They are made to a traditional pattern which makes replacing worn parts easy. She hopes there will soon be classes in making them at Ilfracombe. The competition for a knitted garment resulted- 1.Muriel Hookway, 2. Rosemary Sherwin, 3. Mary Gingell. The Flower of the Month winner was Mary Gingell. We are encouraged to attend the Craft Meetings on the last Thursday of each month. A change of plans for the April meeting, the visit to the Barnstaple Library has been altered to Wednesday afternoon on 20 April. Our speaker on Thursday, April 14 will be Mrs Susan Carey , head teacher of West Down School. The March meeting will revert to a 7,30p.m. start. The meeting was opened by President, Catherine Williams, two verses of Jerusalem were sung. The speaker was from East and West Bakery, Barnstaple. Graham Principe and his wife brought with them a very wide variety of Bread and other bakery for us to buy. His talk took us around the world, he described the various journeys he had made with his wife and now has the desire to go back to a part where he feels there is the need for help in setting up a bakery and is now hoping for sponsorship to enable this to happen. When first coming to N. Devon they ran a restaurant in Fore Street, Ilfracombe. His Bakery is able to provide Gluten free bread and cake and is always prepared to meet anyone’s dietary needs. We enjoyed tasting some of the varieties and choosing some to take home. The competition for a cooked Yeast item resulted 1, Ruth Verney, 2. Pippa Stafford, 3. Mary Gingell. The Flower of the Month winner was Ruth Verney. In a programme alteration our April speaker will be Susan Carey from West Down School. The Library visit will be on Wednesday, April 20 at 2p.m. THE PRESIDENT, Catherine Williams opened the meeting with the singing of Jerusalem. She then introduced the speaker Susan Carey, the Headmistress of the West Down and Berrynarbor Primary schools. These are known as the West Berry federation . Most of us are acquainted with the school in some way. A few actually attended the school in years past and currently some help there in various ways. She told us they have outstanding OSTED reports, there being 96 pupils and a pre-school at the present time. Members who help in the Community Shop commented on the politeness and how articulate the pupils a when visiting the shop. We agreed that some of us would help in the school when they there is a need. The flower of the Month was won by Ruth Verney. Members will be visiting the Library at Barnstaple later this month, also a good from West Down are attending the Lundy Group meeting. Next month is the Annual meeting when there will be a plant stall in aid of our funds. At the meeting we will be deciding on the time of meetings in future, as at present with some afternoon meetings in the winter or all afternoons or all evenings. THE WEST DOWN W.I. May meeting commenced with pupils from West Down Primary School performing some of their “Wake up. Shake up” routines. This was led by teacher Fay Pointer. They start every school day with a session of exercise/performance and it has become so popular that it is being demonstrated to other schools in the area. Our Annual General Meeting then took place. Catherine Williams was re-elected as President and the committee members are -Jane Devlin, Anne Mellor, Di Pine, Pat Seymour and Ruth Verney. We discussed the time of our meetings. A final decision will be made when absent members have given their vote between all afternoons or a winter/summer split. The two resolutions to be voted on at the National Annual Meeting were outlined. Food Waste by Jane Devlin and Dementia Care by Anne Mellor. Various views were put forward and discussed. The Annual Competition awards went to- Highest points 1. Ruth Verney, 2. Pat Seymour, 3. Violet Graham, Flower of the Month trophy-Ruth Verney. We then had refreshments with some lovely cakes to enjoy. There was a plant stall with a wide choice given by members in aid of W.I. funds. This Flower of the Month winner was Jane Devlin. THE PRESIDENT, Catherine Williams opened the meeting with the singing of Jerusalem. There were several forthcoming events discussed. A Lunch at Kentisbury is being arranged for July 6. An outing to Bridport is planned for Sept 3rd. We will run a Cake stall at the Village Fayre on Sunday, July 17. All members are asked to contribute . It was suggested that we hold a Market Stall at the monthly meetings, This used to be very popular so it is hoped there will be members with items to sell. Perhaps surplus Garden produce, plants or preserves etc. She has worked in South Africa, working at night on the streets of Durban helping drug addicts and the lost and homeless. Her time and efforts now go in searching for the parents of abandoned babies, The results of DNA tests are used, sometimes but not always there is a happy ending. It all depends on what the circumstances were that led to a baby being abandoned. DNA can also be invaluable for tracing our ancestors. The competition was for an old family photograph. The winners were- 1, Margaret Thomas, 2. Violet Graham, 3. Sue Robbins. The Flower of the Month winner was Ruth Verney. Driving Safer for longer contact Pat Seymour for details. My first task, on taking over the monthly report of our meeting, is to thank Margaret Thomas for the work she has done for many years ensuring that details of our meetings have been reported in the North Devon Journal. The President welcomed as a guest Jill from the village. She then thanked Paddy for organising our meal out at Kentisbury Manor and said this could become a regular event. The result of the vote re the time of our W.I. was announced with 18 members voting to stay the same but with the evening time changed to 7 pm and the afternoons to 2 pm from November to March. A vote on this subject will now be taken at our AGM each year. The President made a request for help at our cake stall fundraiser at the Dog Show on the 17th as we will be selling the shop raffle tickets aswell. Annie and Graham from North Devon Hedgehog Rescue, now based in West Down, began with a quiz which was won by Nina, who will now be regarded as our hedgehog expert. An informative talk followed which included the information that milk should never be fed to hedgehogs, and a high pitched peep identified one in distress. They brought a selection of gifts to sell to boost their funds. The WI Womens Century book and Jam and Jerusalem dvds are available to borrow. As there were only 15 people who wished to go on the coach trip to Bridport it is not enough to make it viable so it has been cancelled. Ideas for other trips were requested e.g zoo or like Westward Ho had done take a boat trip and eat in a pub. The 12th August is our Garden Party with waiters, there will be a £4 fee. It will start at 2 pm at Beech Cottage, parking will be available in the village, opposite, by the stream and in the building plot nearby. Hats optional. Diary dates: 24/7/2016 Clock Dedication & Flower show; 28/7/2016 Craft Group Poppy knitting 9-12am; 21/9/2016 Lundy Group Autumn Meeting 7 pm @ Pip & Jims, Nautical wear optional, £5 cash only 1 ticket left, contact Catherine; 12/10/2016 Autumn Council Meeting £11 at Pip and Jims Ilfracombe; 24/11/2016 Coach to Worcester Christmas Shopping; 9-11/4/2017 Devon Denman trip £305 +; NFWI AGM Liverpool 7/6/2017. Next Meeting: 8th September 7.30. Speaker Jane. Hospital Train No. 314. Competition – A Medical Item.